After something of an adventure actually getting to my house, "BlushNano" has arrived and is waiting on an actual name. Because BlushNano isn't very catchy. Hair is in the way but she is cute anyway I think. Her mouth is very unwide (err... narrow) and pouty. I think I shall not faceup her myself because I like her current look and don't know what I would do to improve it in any way. 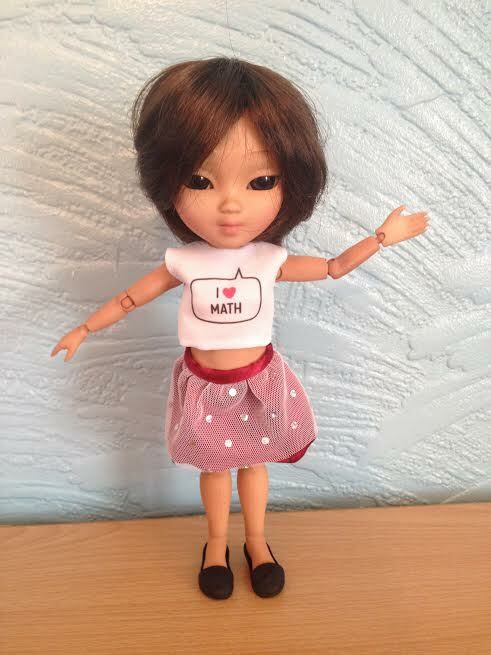 She hearts math(s)! I like her outfit it doesn't feel as odd as some of the clothes previous Makies have arrived in. I thought the skirt looked a bit rubbish on the website but I didn't really mind given that I will be sewing her some new clothes, but actually it's quite nice "in-person" as it were. 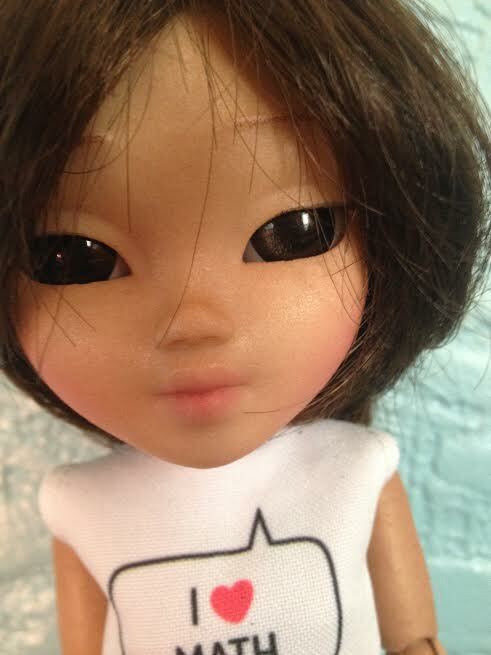 I am thinking about her relationship to my other Makies. Perhaps she is Willow's little sister and Juniper is her best friend and that leaves Strawberry to be Willow's best friend. In terms of a name I am thinking maybe something like "Blossom"? A plant name of some sort anyway. Her little nose is so cute! Blossom goes nicely with your other names. Plant names are really a great way to make your girls seem like a group. If you're looking for other names, there are so many good plant girls' names. Heh, I actually thought of "Sakura" before "Blossom"! Anyways it was a bit of a saga waiting for her but yay she is finally here!